Achilles tendinitis is one of the most frequent injuries suffered by runners. If you run long enough, there is a good chance you'll suffer from Achilles pain at some point. There are many reasons attributed to the Achilles tendon breaking down. However, one cause clearly stands out the most and that's repetitive stress. Let's briefly take a look at the anatomy of the Achilles, how it breaks down, and what you can do to have more resilient ankles. The Achilles is the thickest and strongest tendon in the human body. It is the common tendon of the gastrocnemius and soleus muscles. The gastrocnemius is the more superficial calf muscle and is easily seen contracting when you stand on your toes. It attaches above the knee so to properly stretch it your knee must remain straight. The soleus is the deeper muscle and does not cross the knee, therefore, to stretch it effectively you should bend the knee to take tension off gastrocnemius and isolate soleus. These two muscles act to plantar flex the foot, like when you point your foot down, stand on your tippy toes, or propel you when you jump. When we run, there are periods of time when one foot is in contact with the ground, and there are moments when neither foot is touching the ground. The foot is contact with the ground for 1/10 to 5/10 of a second while the runner is landing with 2 1/2 to 3 times their body weight with each stride.¹ The Achilles tendons main function is to act like a spring storing that force as elastic energy and releaseing it at toe-off. This is extremely efficient since your calf muscles don't have to work nearly as hard. In fact, research has found that your calf muscles perform relatively little work during the propulsive portion of running. Your calf muscles contract isometrically during the late mid-stance phase of your running gait, which forces your Achilles tendon to stretch and return energy at toe-off.² You shouldn't be pushing off with the back foot. An exaggerated push-off could lead to excessive strain being placed on the ankle & foot structures leading to a running-related injury. 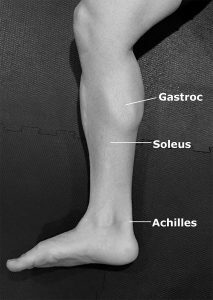 The Achilles, while being the thickest and strongest tendon, has a poor blood supply. That's an important detail to be aware of because blood is needed to transport the cells that help repair and remodel tissue damage. So minor Achilles pain can become a major problem if you ignore it and continue to run through pain. Running, or any type of exercise, stresses tissues. Bones, muscles, tendons, and ligaments will adapt to the demands placed on them as long as the applied stress isn't greater than the body's ability to adapt. So a gradual and progressive training stimulus (work) combined with adequate recovery (rest) elicits increased tensile strength in tissue and improved muscle strength and endurance. However, too much stress performed too soon with too little recovery causes a break-down in tissue. If that persists long enough you're headed towards injury. This is semantics here, but it's important to note so bear with me. Tendinitis has the connotation that the Achilles tendon is inflamed. But that's not accurate. What actually happens is the cumulative stress of running causes collagen fibers that make up the tendon to break down faster than your body can fix them. So instead of laying down a specific type of collagen that makes the Achilles so strong in the first place, your body resorts to using weaker collagen in a desperate attempt to repair the tendon. Kind of like hiring a bad carpenter that uses inferior materials because they don't have enough time to do the job right. Consequently, the Achilles tendon's structure begins to change for the worse. Now your brain receives constant updates about everything going inside your body through the nervous system. At some point, the brain interprets these negative structural changes to the Achilles as dangerous and you'll feel discomfort. That's your body's way of telling you that something is wrong and you should take care of it. So these degenerative structural changes occurring to the tendon make tendinosis a more accurate term than tendinitis. Running too much, too soon, without adequate rest between runs. Sudden increase in training intensity like a big jump in mileage or pace. Changing your running gait and not adjusting your training intensity to allow time to adapt. Drastic changes to footwear. Especially switching to a shoe with a lower heel-toe drop without allowing your body time to adapt. Excessive hill running. While hill work is a great way to improve your running, it can cause injury if you're not ready for the workload. Initially, the first symptom might be stiffness in the Achilles or at the sides of your heel. It's often worse in the morning when you take those first few steps. Pain when you gently squeeze the tendon. A creaking or cracking sensation when you move your ankle or press on the Achilles. 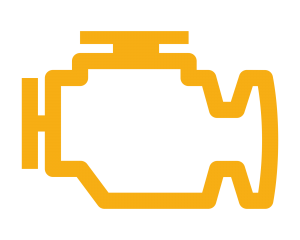 I've seen this in people who clearly ignored the check engine light. Sometimes a lump forms on the sides of the Achilles or a bump forms on the back of the heel. It Hurts Already | Now What? Additionally, gently mobilize the Achilles on a daily basis. This doesn't mean crank the hell out of an already injured tendon. Instead, you can try self-massage and gently stretch your calf throughout the day. If you are particularly tight, the best thing to do is enlist the aid of a healthcare professional who is experienced in soft-tissue and joint work. They can often accelerate progress by targeting muscles that are difficult for you to work on by yourself. Preventing athletic injuries is damn near impossible. If you play, you pay for it eventually. But that shouldn't scare you away from pushing yourself. It's the only way to make progress. Make sure you warm-up adequately before you run. If your calves are tight, and most peoples' surely are, perform self-massage. Follow up self-massage with some static and dynamic stretching. Static stretching is ideally done on off days or after your run. Dynamic stretching can be thought of as movement preparation and is part of your warm-up. If your Achilles already hurts, wearing a shoe with a higher heel-toe drop for a period of time will reduce some of the strain on a painful Achilles. Start cross-training if you aren't already. It should include a combination of strength training, stability, and mobility work customized to your needs. Consider having your running gait analyzed by a professional or running coach if you are injured frequently. Your body will adapt to whatever stress placed on it as long as the stress isn't greater than your body's ability to adapt. Your bodies ability to adapt in constantly changing. If you have a clear focused training program customized to your abilities your chances of getting injured can be reduced. Having a basic understanding of how Achilles injuries occur in the first place and taking your time to build a strong resilient body will make your running efficient and more fun. So enjoy the process and don't fall into the trap of beating the hell out of your tendons and joints. Think about the long haul. ¹ Paul Langer, DPM. Dartfish Video Gait Analysis Guide. ² Thomas Michaud, DC. Dynamic Chiropractic - February 26, 2012 Vol. 30, Issue 05. ³ Alfredson H, Pietila T, Jonsson P, Lorentzon R. Heavy-load eccentric calf muscle training for the treatment of chronic Achilles tendinosis. Am J Sp Med 1998;26(3):360-6.